Night in the Woods hit me hard. It hit me in a way that video games very rarely do these days. Even now several days after having seen its end credits, I constantly find myself thinking back to the emotional rollercoaster of a journey developer Infinite Fall had taken me on. I want to tell my friends and family about each moment spent with its characters or every reveal the game threw my way. The fact of the matter is Night in the Woods is such a rare experience on any system, let alone the Switch and one that will keep you glued from start to finish. You play as the 20-year-old anthropomorphic cat Mae, a college drop out who has just moved back to her small hometown of Possum Springs. Living back with her parents in their attic she quickly reunites with her old high school friends Gregg the fox, his boyfriend Angus the bear and Bea the alligator, a group whom all work but all suffer from the same uncertainty of adulthood. Readjusting to her hometown life once more, you’ll spend time with friends, your parents, and generally explore the settlement and meet its inhabitants – activities that at first might seem fairly innocent enough but slowly unravel revealing a far deeper and darker tale at its core. You see Night in the Woods doesn’t try to weave a yarn about some sort of end of the world situation or a brave hero saving damsels in distress or an epic war. Instead, its story is much more intimate and identifiable, touching on subjects that feel so human you can’t help but relate in some cases (an amazing feat in itself considering we’re talking about… well, talking animals here). There’s a constant air of mystery about the town, its mines and, of course, the disappearance of Mae’s long-time friend Casey looming that will propel things forward, but it’s the subject matter along the way that left the strongest impression on me personally of any game I’ve played in recent years. And the game does go for some rather delicate topics, mental health, for example, being one of them. While other games might use this subject as a means to clearly and plainly define its villain or as some sort of gimmicky gameplay mechanic, Night in the Woods does so in a more meaningful way. Where we as the player are seeing these characters’ experiences with what might be depression, problems with parents, self-doubt, anxiety, or dissociation rather than just plainly focusing on the issues themselves. A large part of the reason that Night in the Woods’ story works so well is in how strongly its characters are written. Everyone that you come across has something about them that draws you in and makes you want to take the time to learn more about him or her. Sure, you’ll likely have favourites, whether it’s the hyperactive Gregg constantly flailing his arms around in excitement (plus one scene that had me laughing so hard involving cups) or the goth-like Bea, but even then you’ll still want to put in the extra effort to talk with everyone. Characters aren’t merely one-note either like so many other games. Here you’ll discover a cast as complex as they are diverse. Take the aforementioned Gregg for example, who on the first appearance just seems like an over-excitable troublemaker but as you spend more time with him soon reveals there’s much more than meets the eye. Every conversation or hangout session is so expertly crafted you forget these are talking animals in a video game. Countless times I would pick up on little nuances where I’d recall and be reminded of my early 20s and how I might talk or interact with my friends back then. Mae at the centre of it all sees her character transform with every passing day making the eventual reveal of her troubled past work so well. Throughout her transition, though the game never made her unidentifiable, her character shift is organically done rather than forced and rushed. Again, all this made all the more believable thanks to the emotional conversations she’d be involved in. In fact, the best way to summarise all the dialogue in the game is real which again only serves to further the impact of the game’s story, its themes and the characters themselves. Had the conversations felt forced, rushed or phoney, then all effect is lost on the player. Night in the Woods elegantly sidesteps these pitfalls with ease. The game offers you the freedom to explore the town of Possom Springs chatting with its locals and sometimes participating in small, basic mini-games when playing with your band, or, as strange as it sounds, having a knife fight or shoplifting. At its heart though, this is very much a narrative-driven experience that at times can feel like a book with very brief moments of platforming and exploring. For those who tend to stay away from these sorts of slower paced adventures, this may be off-putting. I’m not going to lie; there are moments when you’ll be sat through long conversations which as engrossing as they may be, won’t change the minds of those who have their minds set against these types of games already. The game’s visual style is certainly misleading, its cartoon-like appearance throwing you off the scent of its deeper underlying material. This is by no means a criticism, the approach taken resulting in a world so rich in atmosphere and mystery and characters so full of charm and emotion. Whether in docked or handheld the game runs without issue but I would recommend a game like this be played at home where you can absorb every drop of its excellent soundtrack and story rather than distracted out in public. It’s worth pointing out that the Nintendo Switch version of the game also includes the Weird Autumn add-on that includes some new characters and mini-games. If like me you’ve never played the original release last year then these inclusions will likely blend in without notice though. Longest Night and Lost Constellation are also included and accessible through the menu. 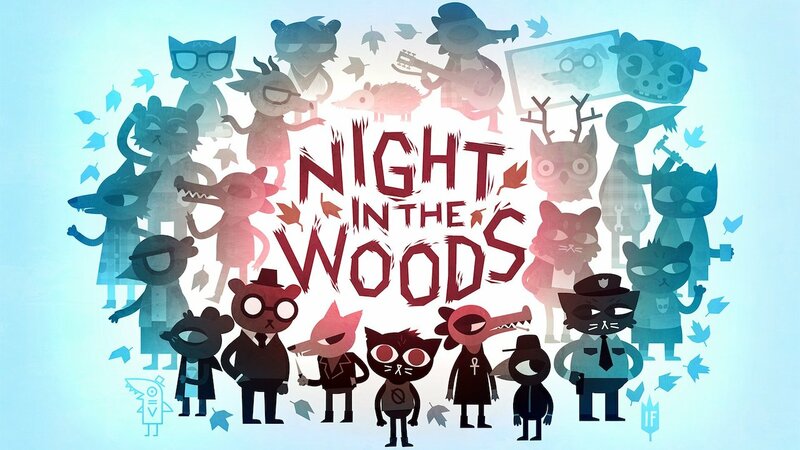 Night in the Woods is an incredible, heartfelt journey that goes above and beyond anything currently on Switch when it comes to its character development and storytelling. While the pacing might not be to everyone’s tastes, Night in the Woods is a truly unforgettable experience and one I’m sure we’ll be talking about for years to come.